1 of 4 In a small bowl, stir together stir-fry sauce, 1 seasoning packet from ramen noodles and ginger. Set aside. 2 of 4 In a medium-size saucepan, cook ramen noodles following package directions. Drain. 3 of 4 In a large skillet, heat oil over high heat. Add chicken; stir-fry for 4 to 5 minutes. Add water chestnuts, celery and vegetable blend; stir-fry for 2 minutes more. Add cooked, drained ramen noodles; stir-fry for 3 minutes or until heated through. 4 of 4 Pour in sauce; add cashews. 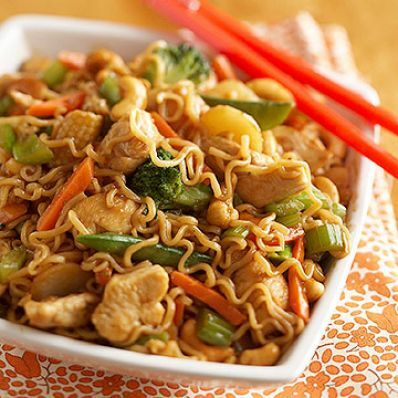 Stir-fry for 2 to 3 minutes or until sauce is mostly absorbed.